Time to share what I purchased during the month of June. I shared a post on the Bare Minerals Mystery Box and all the products I received in that box. You can check that out here so I won't go through those products again. I forgot to take a picture of my Sephora play box so that won't be included this month. However, everyone receives the same products so you can check that out many other places on the web if you're interested. I was on the last little bit of my Tea Tree Oil which is a necessity for me. My Ulta was out of the single bottles so I purchased this kit instead. I will definitely use the skincare products in the set and the products would be at lest $40 if purchased separately so it was a good deal. 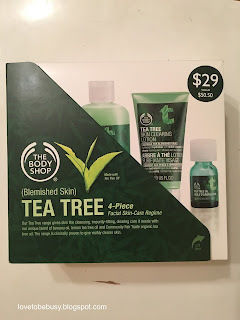 There were a few things that caused this purchase:) I had a 20% off coupon, Matrix was buy 2, get 1 free, hubby needed shaving stuff, and there was a platinum bag with $125 purchase. I needed a clarifying shampoo and then a back up hairspray and shampoo because I am running low on my current ones. I wanted to try the travel size of the light shade of the CC cream. The fair shade is too light for me so I want to see how the shades compare. The Art of Shaving is hubby's face stuff. There was another shave product they shipped separately too. After my coupon and points, I paid around $80 and got the platinum sample bag. Hubby's shave stuff is expensive so I try to get it when there is a coupon. 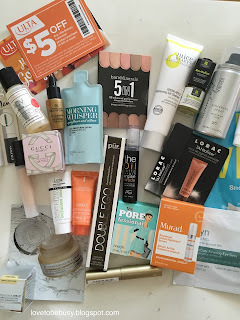 This is everything that came in the platinum sample bag. There are lots of good sized items in this bag and very few things I won't use so it was a great decision to go for this one. The only purchases this month that I wouldn't consider necessities was the Bare Minerals box. 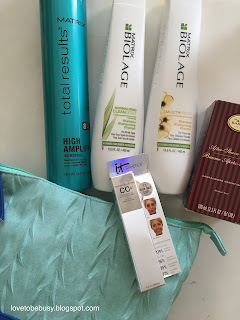 I needed hair products and the skincare (mostly:). That being said, if you follow me on Instagram, you know that I am on a no buy for July. I do not need beauty products for awhile and I am trying to pare down and make more thoughtful purchases when it comes to everything. I have done well for the first 11 days and haven't purchased anything. What have you purchased lately? 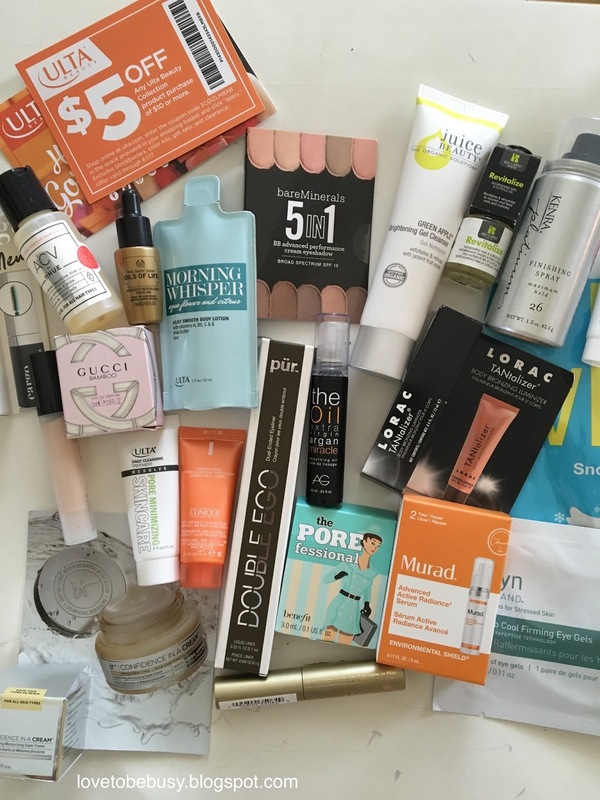 Since it has been a few months since my first haul post back in April (of my March purchases) I will be posting an update this month on those products to let you know my thoughts.